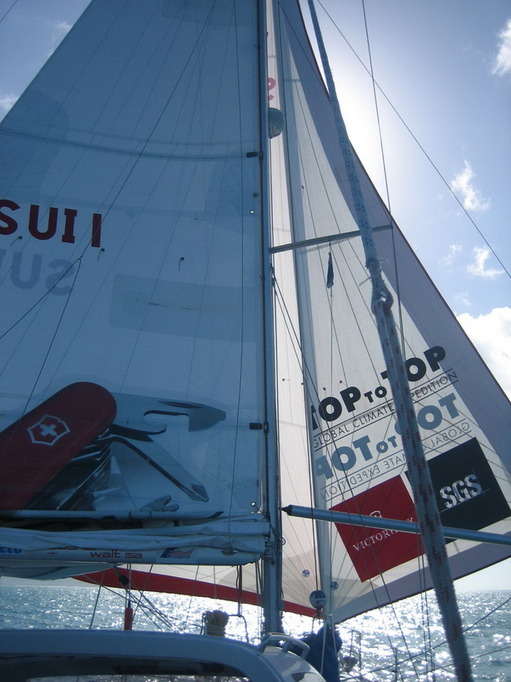 It was all “go go go” in Cairns before the TOPtoTOP Global Climate Expedition continued on to take its next step – Sailing north to Darwin! 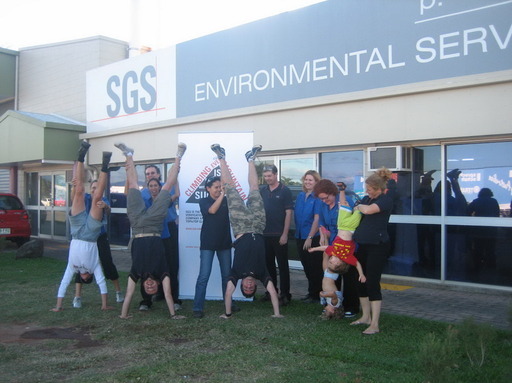 Before the departure, we all said goodbye to our great friends here in Cairns from the SGS environmental services office, Peter Käsermann and his family, and a local Swiss Bakery where we bought yummy Swiss bread each morning! The friendships built here were absolutely fundamental to the success of our visit in Cairns. Their hospitality, generosity, kindness and willingness to help out in any way they can really supported the expedition to be able to visit so many schools, gain great media attention, and bring happiness to the whole family! But it was time to say goodbye to our home in cairns, and take the next step forward! 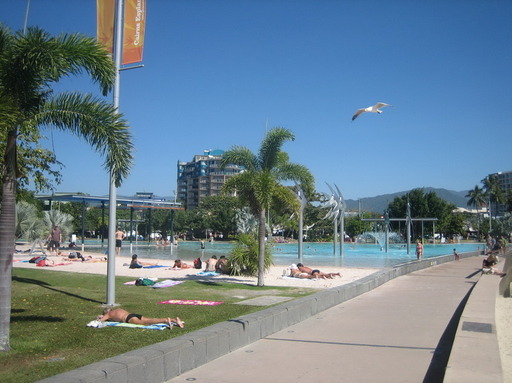 Salina and Anrdi would certainly miss their “backyard” in Cairns, where they played in the lagoon almost every day! 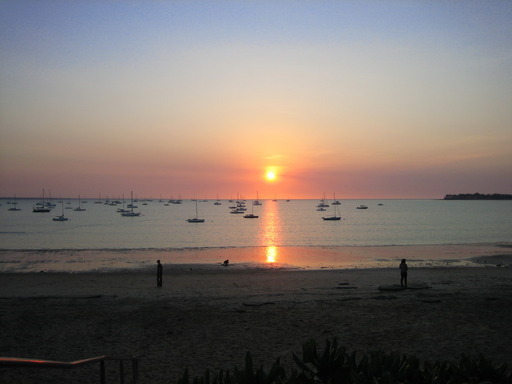 The first stop after leaving Cairns was Lizard Island. This is a very historical place for Australia, as it was there that Captain Cook came ashore, and climbed to the peak of the island, and for the first time be able to see into the distance and navigate his way out of the extensive stretch of the great barrier reef. The expedition team walked to the peak, and from the top of the island, the reef looked stunning, stretching for miles and miles either side of the island into the distance. You could see where the reef shelf stops, and drops off 2000 meters into the ocean!!! From Lizard Island, we had a stop off at Stanley Island, part of the Flinders Group, and then at Morris Island. Morris was a fairly barren place, with only two distinctive coconut trees in the middle! 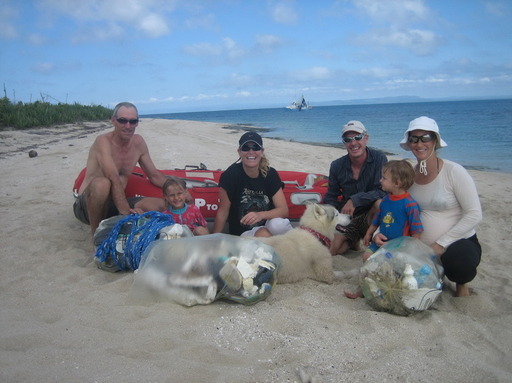 And although the though there was still plenty of bird life, particularly polluted with trash, and the TOPtoTOP team did a big clean up of the island, with another yacht which was anchored there from Germany, “Spirit of Assey”. It was amazing the number of thongs that can turn up on the shore of a deserted island!! The good winds held up, and the sailing north continued to Cape Grenville. 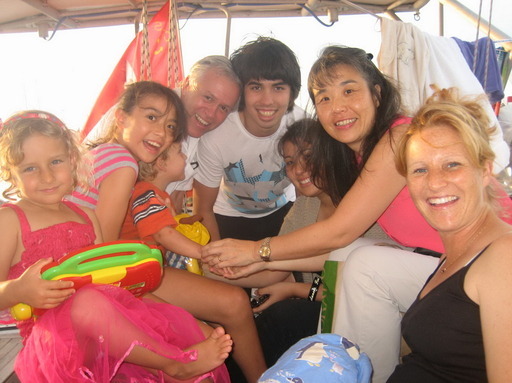 The whole family was in for a bit of surprise on shore, when Dario and Sabine spotted a crocodile in the ocean!! Luckily we didn’t run into him again! But it made us all much more thoughtful about paddling into shore!!! Cape Grenville was stunning Australian coastline, thick with mangroves and wildlife. The other volunteer, Clive, is a bird watcher, and attentively studied the birds at each location. 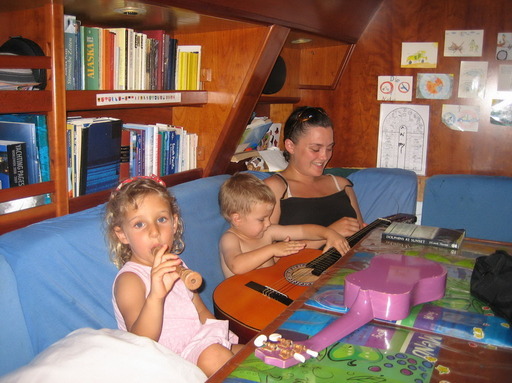 On this leg of the journey he paid special attention to the birds at sea and on the islands where we anchored. We anticipated that the number of sea bird species in Northern waters would be fewer than further south due to the warmer water and less food resources. However for Clive, a southerner, it was great to see a good number of frigate birds during the trip as they do not occur south of Queensland. These pirates-like birds look majestic with their 1.5m wingspan, and are very agile for their size. This enables them to out fly smaller birds, and harass them into releasing their fish catch. The frigate birds then swoop and scoop up their ill-gotten booty, their main source of food. 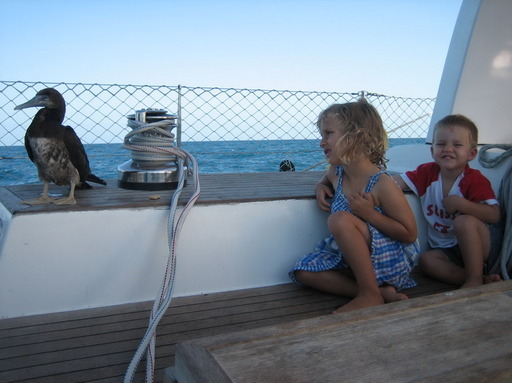 Both Greater and Lesser Frigate birds were seen, on several occasions each – the last time on the approaches to Darwin. Other birds of special interest were the migratory waders. Huge flocks of these birds spend the southern summer on the mud- and sand-flats of the Gulf of Carpentaria, the Cairns area including the Esplanade, and Roebuck Bay near Broome, amongst other sites. These shorebirds have an amazing lifestyle, necessitated by their food-harvesting. Each wader species (eg sandpipers, plovers, curlews) harvests creatures from mud- and sand-flats at a depth (in the mud) determined by their bill-length – which varies from less than 2 to 20cm. To raise young however they need to locate alternate food sources for the chicks, which for a few weeks have much shorter bills than their parents. Their evolutionary choice was to use the insect-rich plains of the northern tundra, sometimes deep in the Arctic Circle. Here a chick has merely to open its bill, and the insects are very easy prey. Within an hour of hatching they can feed themselves. This is just as well as the mothers have long left the breeding grounds and only a few adult males remain for some protection and education. And within 2 weeks in many species, the young are on their own to grow to full size and put on sufficient fat to fuel their southward journey. This they achieve in 2 months after hatching! The adults of many species can fly the 10 to 13000km journey south in 2 to 3 legs, stopping at swamps or other suitable mudflats to eat and rest. The juvenile birds however are not strong enough to do this as quickly as the adults and need special intermediate pitstops to refuel. Each bird will use these special swamps and estuaries only use once in its life, and generally locate them by genetic programming alone! These shorebirds are seen in Australia in winter in small numbers while they are in their first or second year. So we saw a few wader species in Cairns, up the Reef and on a few of the islands near the Gulf. We also saw several other seabirds, including Boobies, Herons and Terns. On the islands where we stopped, a good number of bush birds were noted, including the Pale White- eye, a cousin of the more common Silvereye. The White-eye is generally not found on the mainland. During the 2 week journey, about 70 or 80 surveys were carried out along the coast and will be submitted to the Ongoing Atlas of Birds Australia. About 65 – 70 different species were observed. The journey continued as we got closer to the top of Australia. Our last stop before entering the Indian Ocean was at Mount Adolphus Island. This was the most stunning of all the islands, and seemed to be the most lush with life. As we paddled into shore, we noticed amazing stingrays on the ocean floor! These are incredible creatures, bright orange with electric blue spots and eyes bulging out of their head! It was nice to stretch our legs on shore, and Dario couldn’t help himself to climb to the top of the rock face on the island for a happy snap! Although the lack of sleep and heat was starting to take its toll, no one was sea sick, and Sabine was thankfully feeling well. But not everything was smooth sailing! At Adolphus Island, we discovered that the course computer had a meltdown and wouldn’t function! Without that, we did not have any charts to navigate!! Luckily Dario had a very old backup one, which survived until Darwin, thank goodness! 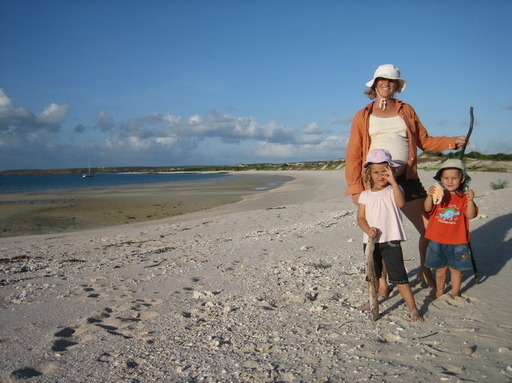 After Adolphus, “mori” island, we crossed Cape York, the very top of Australia. It was a very emotional moment for the family, and a significant step closer towards their next goal. 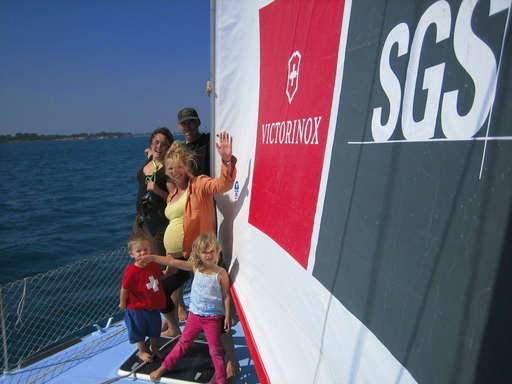 Everyone felt an overwhelming sense of achievement and excitement for what lay ahead in the Indian Ocean!!! 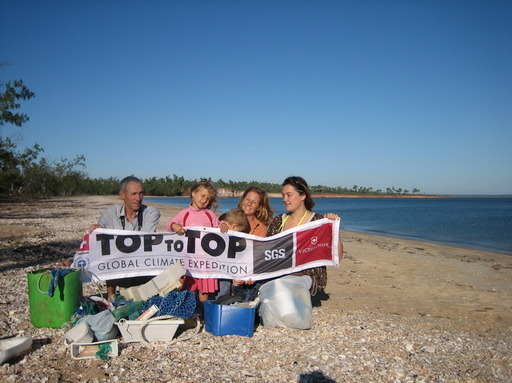 From Cape York, we stopped heading so far north and started making our way west across the Gulf! There was one night of hectic sailing, with winds around 35 knots, and PACHAMAMA flying at an incredible 14 knots speed!! Once on the other side, after a few days sailing, we anchored at Marchinbar Island, part of the Wessel Islands. From the anchorage the land looked extremely flat and the sand pure and creamy gold. The beach stretched for miles along the coast, but only ran back a few meters, before heaping up to form a small dune covered with wild aussie scrubs. It was a fantastic place to explore, with animal tracks from kangaroos, emus, crocodiles, snakes and even stray cattle on the sand! The Sunlight into dusk was amazing, and poured a stunning golden light over the landscape, turning everything into a surreal sepia backdrop. At nighttime, the phosphorescent plankton in the water lit up every movement, and we could see splashed of fish light up like gold! …and the night shifts were lit up with a vibrant night sky, the moon rising later the further we moved. 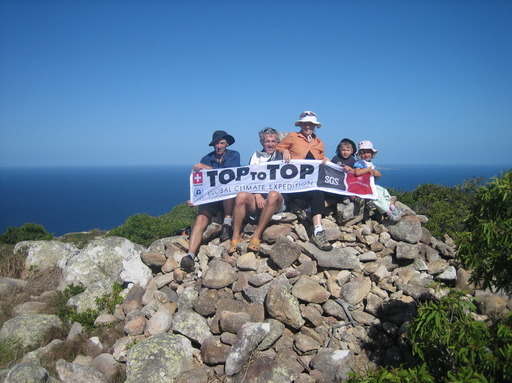 Crossing the top, we really started to feel and experience the utter magnitude and expanse of Australia. Further west we could see some kind of civilization at last on the edge of the coast, and campfires lit up at night along the beaches. At our next stop we hit mainland, and anchored at Port Essington, which is home to Garig Gunak Baru National Park. The smoke here is incredible, as the Northern Territory prepares to burn off extensive areas of the land to help prevent the severity and likelihood of uncontrolled bush-fires. The landscape had certainly shifted, and has a much more distinctive “outback” feel. The coastline now shares its beach with a cliff face of red earthy rock and clay. The plants and fauna have also changed dramatically in contrast to further south, and the fauna now appears much darker, paler green of gums and wattles. We all performed another thorough cleanup of the beach, and Salina was particularly diligent in her efforts of finding fishing rope, foam and plastic junk. Whereas Andri was more interested in the shells! Sabine was in awe of the wonderfully silk-soft clay which made up the cliff face of the island, and we all found the bright purple color of the clay quite incredible! The sailing finally hit a rough patch when we continued, and some choppy waves and stronger winds sent Pachamama rocking from side to side! Andri was seasick, and everyone’s efforts had to step up to keep control of the motion! We continued making our way to Port Don, and onwards towards the mainland and Darwin! We made 130 nm in 13 hours thanks to the curent and up to 43 kn of wind. It took about two weeks in total for the 1200 nm from Cairns to Darwin, but all the varying experiences at each island and anchorage left us all feeling like we had been on this amazing adventure for months! Although it was a huge relief to finally arrive! Sabine could now relax with the knowledge that we were at a much closer distance to medical attention for her yet to be born bub! We wished Clive farewell, and thanked him for his help throughout the passage, and knowledge he shared with us all about his birds. It was a big distance to cover for the expedition, and there is certainly something very gratifying and heartwarming about arriving into a new state of Australia, a new ocean of the world, with a new baby on the way!! !